Whether we understand compound interest or not, we will ALL hit those golden years and have a desire to quit the work force. The separating factor between those who continue to work and those who retire is that some planned for it and others did not. Those who planned probably heard about that mathematical magic behind compound interest. It isn’t a get rich scheme, but a life long decision and commitment to saving for the future. Albert Einstein called compounding interest, “The greatest mathematical discovery of all time”. Compound interest is mathematical but you don’t need to know calculus or geometry to use it. All of us, no, not just those who work on Wall Street. All of us can use it in investing. Compound Interest aka as Compounding is generating earnings on reinvested earnings. Instead of withdrawing your earnings you keep it invested and let it continue to compound. The longer you let compound interest work the more benefits it can do for you. At the end of the second year you’ll have $2657.88 total when you only put in $2400. That’s $257.88 in earnings. Follow this for 30 years and you’ll have $121,287 when you only contributed $36,000. That’s a whopping amount of free not-hard-work cash you’ve earned. Imagine how relieved you’ll feel about the pressure of retirement. Why Do I Have to Start Early? Let’s look at 2 individuals who both used compound interest but started at different ages – Jack was 25 and Jane was 35 – They both plan to retire at 60. Jack invested $10,000 at an interest rate of 5% and compounded annually. He has 35 years to retire and this original $10,000 is now $55,160.15. He didn’t increase his contributions. In fact, all he did was leave the principal and interest (earnings) untouched and invested. Jill also invested $10,000 at an interest rate of 5% and compounded annually. After 25 years her original $10,000 is now $33,863.55. Why the huge difference with only 10 years difference? Jack has accumulated more interest, and that interest is generating and accruing more interest and earnings. That is compound interest. Do you see the importance of starting early now? Want to do the math for yourself? 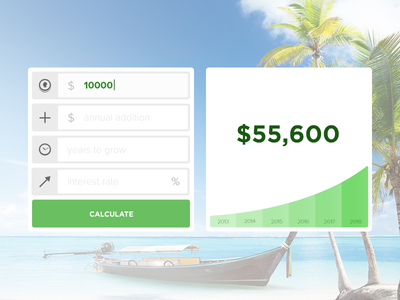 Use our compound interest calculator here. Where and How Can I Use Compounding? It’s much simpler then you’d think and you’re probably already signed up for it through some type of investing account without even knowing. Have an employer 401k? Have a Roth or Traditional IRA? Got a brokerage account? Own any Target Retirement Funds? If you got any of these and own some stock, Index funds, Mutual Funds, bonds, Forex or something similar that generates profit and you are reinvesting your earnings then you’re using compound interest. Compounding can be generated through many different investment vehicles. You’ll have to keep your hands off the principal and earnings (interest) to let it grow. Save early, don’t touch it, and let it compound! This is a guest post by John, he blogs about Personal Finance and Men’s Life Style Topics. If you’re interested in guest posting please read our guest posting policy and then contact us.